Click the Image for More Details on last date and how to apply. The responsibility for laboratory safety rest: with each and every person working in the laboratory. Improving the safety of the work environment through the recognition, evaluation, and control of hazardous conditions is extremely important. This certificate program ensures the mandatory knowledge of laboratory hazards along with safety precautions needed for the laboratory professionals and students enrolled in health science courses. The principles and procedures of laboratory waste management will also be dealt with. This program is designed for students of health science courses including medical biochemistry, medical microbiology, clinical laboratory science, clinical pharmacology, biotechnology enc. Though tailor made for clinical laboratory students and staff, this program is designed to suit any research or health personnel in terms of laboratory safety and waste management. The course will also benefit the staff employed in health care, pharmaceutical, and biotechnology industry. To make them to know the rules and regulations that help keep the laboratory a sate place to work. to this, emergency response procedures in the event of fires, spills, explosions and other laboratory accidents will also be dealt with. materials and handouts also will be provided. • Only 15 students per batch. The candidates will be selected on a first come first basis. Selected candidates will be informed separately. clinical laboratory, research labs and industry will also qualify. There will be a written and an oral examination at the end of the course. Minimum marks for a pass is 50%. Each candidate will be declared successful based on a continuous assessment process throughout the course. The marks obtained in the examinations and attendance will also count. 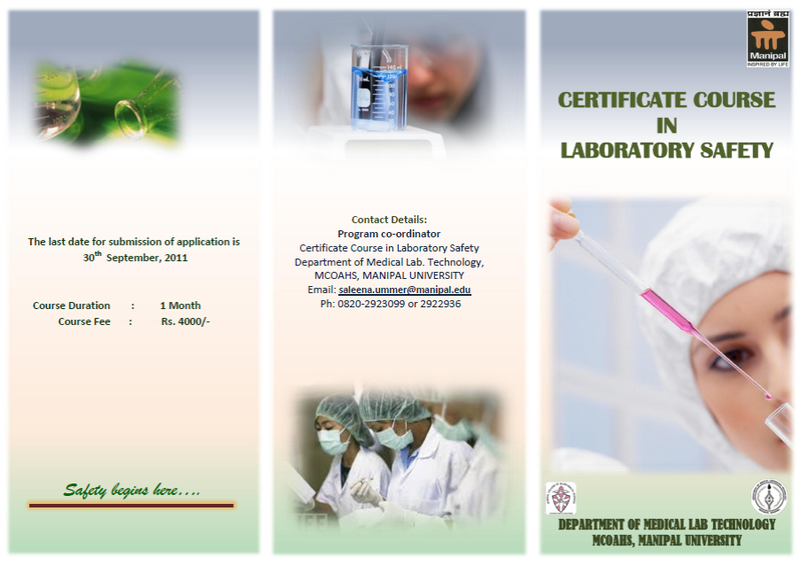 On successful completion of the course each candidate Will be issued a Certificate in Laboratory Safety. A course transcript along with the certificate will be issued by the Department of Medical Laboratory Technology, Manipal College of Allied Heath Sciences, Manipal University.